The goal of surgical treatment for degenerative lumbar spinal stenosis (LSS) is to effectively relieve the neural structures by various decompressive techniques. Microendoscopic decompressive laminotomy (MEDL) is an attractive option because of its minimally invasive nature. The aim of prospective study was to investigate the effectiveness of MEDL by evaluating the clinical outcomes with patient-oriented scoring systems. Sixty consecutive patients receiving MEDL between December 2005 and April 2007 were enrolled. The indications of surgery were moderate to severe stenosis, persistent neurological symptoms, and failure of conservative treatment. The patients with mechanical back pain, more than grade I spondylolisthesis, or radiographic signs of instability were not included. A total of 53 patients (36 women and 17 men, mean age 62.0) were included. Forty-five patients (84.9%) were satisfied with the treatment result after a follow-up period of 15.7 months (12–24). The clinical outcomes were evaluated with the Oswestry disability index (ODI) and the Japanese Orthopedic Association (JOA) score. Of the 50 patients providing sufficient data for analysis, the ODI improved from 64.3 ± 20.0 to 16.7 ± 20.0. The JOA score improved from 9.4 ± 6.1 to 24.2 ± 6.0. The improvement rate was 73.9 ± 30.7% and 40 patients (80%) had good or excellent results. There were 11 surgical complications: dural tear in 5, wrong level operation in 2, and transient neuralgia in 4 patients. No wound-related complication was noted. Although the prevalence of pre-operative comorbidities was very high (69.8%), there was no serious medical complication. There was no post-operative instability at the operated segment as evaluated with dynamic radiographs at final follow-up. 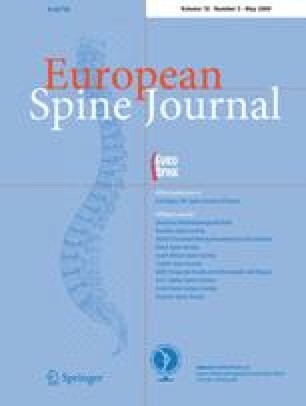 We concluded that MEDL is a safe and very effective minimally invasive technique for degenerative LSS. With an appropriate patient selection, the risk of post-operative instability is minimal. This study was supported by the grant FEMH-96-C-039 from the Far-Eastern Memorial Hospital.